This is the elevation we selected for our new home. The elevation is the design and layout of the exterior of the house. This particular house, the Turner�, offered a total of five elevation choices to choose from. Some of the elevations offered stone or brick facades on the first floor, different window configurations on the front, larger porches or varying roof designs. 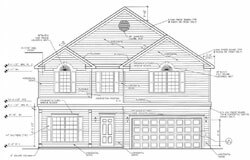 We chose this elevation for is large front windows and dollhouse-like appearance. The roof for this particular elevation also has a tall, steep gable that makes our home look slightly larger in the cul-de-sac compared to the two neighboring houses making a nice, standout finish for the entire end of the street. We choose yellow-cream vinyl siding, white trim and gray shudders to complete the look. What would your dream house look like? Will it have a wide and open front yard, or do you want a wide and open back yard? How many trees and plants will there be in your garden? Do you have a table, a small hut, or a conservatory in which you and your friends could hang out and relax? Do you want a balcony? Are your interior walls painted in your desired color and does the furniture match the colors exactly? These are only some of the questions that you may have to answer when creating a blueprint of your dream house. The most important thing that you should know about when building your dream house is the steps of construction. Before you dive headfirst into building your dream home, there are some things that you should know and perform before others. Money is the first thing that you should consider before anything else. Go over your budget and make sure you have enough funds to complete your dream house. You should have all loan applications and approvals before beginning anything else. Make sure that you can secure the exact amount of money needed to build your dream house and not leave it standing incomplete. Always plan for extras and have extra money available for unforeseen problems and changes. Next are the blueprints. Make sure that you work alongside your architect, if you want to employ one, and state what you want in your house. Also, do not hesitate drawing your own plans. You can use a computer and a program to make blueprints like Plan3D or AutoCad, which could save you some money. Before applying for your building permit you will need an approved set of blueprints. Do not hesitate to ask your local building department tons of questions, that is what they are there for. Take your plan into the building department's office and let them check it beforehand. This is important to ensure that you are not violating any rules or laws regarding the areas building zoning laws. If you pass, proceed to buy the piece of land for your dream house. Negotiate contracts wisely and from persons that you can trust with your dream house plans. Always use a lawyer for any land transactions. If you are not building the home yourself now is the time to find the right builder for the job. Conduct interviews, get prices, and ask for references. Establish a good relationship with whomever you choose. You will deal with the builder on a day-to-day basis for up to six months. You have to have great communication so things can run smoothly. The following is a basic overview of the steps involved in building your house. 1. Establish a temporary electric supply from an electricity company, preferably the one who will supply you with electricity after completion. 2. Employ a good excavator and set out the boundaries with foundation corners in check, make sure to set up an erosion control plan. 3. Remove the topsoil from the site and dig a hole for the foundation. 4. To keep mud from spreading whenever it rains, ask that gravel be put down as base for the driveway. 5. Set the form of the base of the house after completing the foundation and pour concrete. 6. Set the form for the walls and pour the concrete. Make sure that it is waterproof and is insulated from the outside. 7. Backfill the foundation after it is thoroughly set. 8. Frame the floor joists, and apply underlayment. 9. Frame the interior walls and make sure that the bathroom is in the space left for it before any other walls are framed. Then apply exterior layer of inner walls, either paint or other waterproof material to finish it. 10. Frame the roof and apply exterior finishing. 11. Call the employed electrician and plumber to start their work. 12. If you are in a country setting, dig deep to install a septic tank, and if not, connect the plumbing to the city's drainage. 13. Apply exterior finishing and insulate. 14. Finish the interior designs. 17. Move-in, call your friends, and host a party.